Great Mod! The F5 and F6 screens are large, legible and make a huge difference in being able actually use them. My question...I do not notice any contact lines or bearing lines to a target. Has this feature been eliminated in your GUI or simply disabled. If disabled could your tell me how to activate that feature once again? Did not have gods eye engaged when I reset realism settings. Again, great F5 and F6! as you know I am currently rescaling this to 1680x1050 for myself. I made a lot of progress but where do I change the position of the loading screens? Could not find it in the menu_1024_768.ini? Hi! What loading screens did you mean? 1. First make a picture of 1680x1050. 2. Then change the resolution to 1024x768 and paste it for example in Map.tga at the top (see how done I have). In the game, the picture will be 1680x1050 resolution, but with poor quality. It is difficult to fix this because it is embedded in the game engine code. Hi! Thanks! They are displayed if this is activated in the realism settings. And only when the periscope is below. Quick question how do you use the RAOB Wheel with this mod to get the AOB?, do you use the same method as OLC's UI? !!! VERSION FOR INSTALLATION ON TOP OF VERSION 0.3 !!! Copy folder "data" to the game folder with the replacement of files. Or you can enable it via JSGME. Last edited by Delta Wolf; 07-08-2018 at 02:38 PM. Thanks very much for making a Widescreen mod! I am impressed by the opening screen which shows a nice video and historical images. I see you have cured the presentation very well. However, please let me mention 2 issues, the 2nd one being more severe and could mean a no-go for many players because of it. So hopefully you're trying to correct. a) German accents remain in cyrillic in the menu, in messages and screen names in-game. This is not a big issue. To correct, take the fonts from Ahnenerbe's mod for WAC5.01 and incorportate them. b) Like in Ahnenerbe's GUI, the mouseclicks are screwed-up meaning you can not reach all compartments of the sub. E.g. the back area of the command room cannot be reached, neither by shortcut or the mouse; right-clicking on an officer will not always take his place of view. Right-clicking will not always take you back to conning tower like in the stock game. Take a look at the Conus GUI (with GWX3.0) to see how mouseclicks should work. Note that a fast movement within the sub is a big part of game immersion in SH3. All this is more severe depending on how a simmer wants to play the game (shortcuts or mouse clicks, zooming optics). Unfortunately I know it's difficult to fix because it clashes with the optics and cameras, so I have no good solution to propose, I can only say that it will be a no-go for many players chosing between zooming optics or moving at ease in the sub by using the mouse. I hope you accept my feedback as helpful for you. Last edited by XenonSurf; 07-11-2018 at 08:12 AM. i have encountered those issues ( icons that dont do anything when clicked ) in some older versions of Ahnenerbe mod that i used in CCoM at some point but they were fixed eventually , the latest improved Ahnenerbe mod ( the one used in WAC) works perfect, all shortcuts work as intended , until this mod showed up i used it a lot with NYGM and it worked perfect . That being said, i have none of those old issues with this mod, it works perfect also, it might be a conflict with other mods or some things from your supermod . Thanks, but no, nothing to do with my supermod (GWX3.0), it's the same problem in Ahnenerbe's WS with WAC5.01. But I have found a 90% solution, see next response. Last edited by XenonSurf; 07-11-2018 at 11:13 AM. For the mouseclick problems (see point b in my response above), I have the perfect workaround (at least for me) by replacing the camera.dat taken from the Widescreen mod MaGui Final version (the one before v.3.4 was published). observation periscope will zoom at 1.5x-6x, the attack periscope at 1.5x-6x-12x (very good for identifying flags), the UZO will not zoom at x6. Last edited by XenonSurf; 07-11-2018 at 12:20 PM. 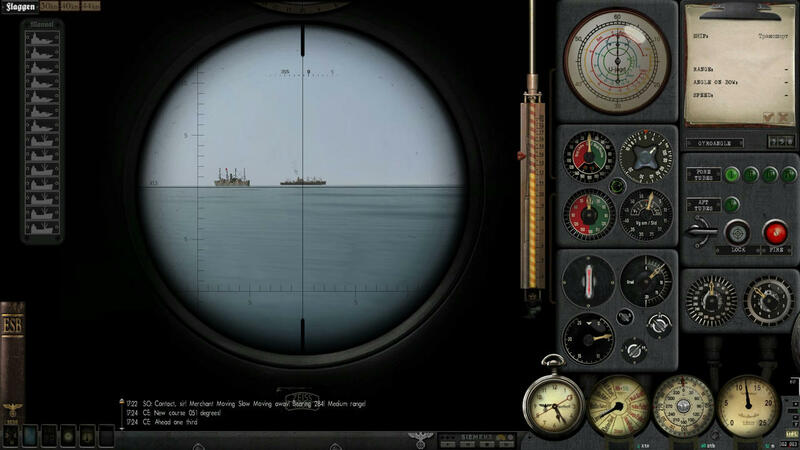 Would it be possible to add the Vertical and horizontal marks to the reticle when we select the RAFOB? Just like the OLC's UI? Not sure if this is possible but it would be great.